Home › featured posts › Does Acts 6:5 function to establish Stephen as a Point-of-View Character? by GARY YAMASAKI A previous post suggested the “badge of reliability” may qualify as an ideological-plane device for leading readers to experience a specific narrative event through the point of view of a particular character. This post looks to a textual feature of the Book of Acts as a possible means by which the badge of reliability might be bestowed upon a character. Acts 6:1-4 presents the circumstances surrounding the establishing of the Seven, a group intended to free up the apostles from having to deal with everyday matters arising within the community of Jesus followers in Jerusalem. Verse 5 identifies the Seven, and it is interesting to note that while only a name is provided for most of them, the mention of Stephen is also afforded the descriptive phrase “a man full of faith and the Holy Spirit.” The narrator singles out Stephen here, and it is not simply to provide some extraneous detail about him, as is done for Nicolaus with the inclusion of the fact he is a proselyte of Antioch. Rather, the addition of the phrase “a man full of faith and the Holy Spirit” clearly separates Stephen from the others in terms of spiritual stature. In fact, I would suggest that this phrase functions to bestow upon Stephen the badge of reliability. Of course, this mere phrase pales in comparison to the chapters-worth of material used by Matthew to bestow the badge of reliability upon Jesus, as outlined in the Apr 15/2013 post. However, recall that Matthew’s intention is to establish Jesus as a reliable reflector of the implied author’s ideological perspective for the whole rest of the narrative, which requires the degree of effort expended by Matthew in the early chapters of his narrative. Regarding Stephen, I am not suggesting he is here being established as a reliable reflector for the whole rest of the Book of Acts, but rather, only for one episode. This being the case, much less is needed for the bestowal of the badge of reliability. Another issue to be addressed is the purpose behind this particular bestowal; after all, if the bestowal of the badge of reliability is to establish a character as reliable for a particular episode, there must be something in that episode the character says or does about which the readers may be apt to disapprove, thus necessitating the bestowal of the badge of reliability to assure the readers that the character’s words or deeds do reliably reflect the implied author’s ideological perspective. Is there anything in the account of Stephen reflecting such a dynamic? 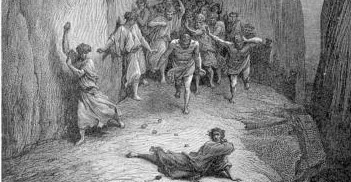 The account ends with Stephen being stoned to death (7:54-60). To this point, the readers have witnessed Jesus followers being persecuted, but never to the point of death. This being the case, the fact Stephen ends up dead here runs the risk of having the readers wondering if Stephen had actually overdone his rebuke of the religious leaders. In a circumstance such as this, bestowing upon him the badge of reliability earlier in the passage serves to eliminate this risk by assuring the readers beforehand that what they are about to witness is totally within the ideological perspective they are intended to adopt.